Sea Going Green had the honour of being present at two high-level EU functions in Brussels this week. This included a conference to mark European Tourism Day 2018 hosted by the European Commission on November 7th, and an international workshop by the MITOMED+ project hosted by the European Parliament on November 8th. As sustainable tourism enthusiasts, Sea Going Green was thrilled at the opportunity to take part in both conferences, each attended by prominent MEPs, big players in the tourism industry, representatives of local and regional authorities in our target areas, members of the academic community, and a bunch of forward thinking dedicated startups. The word on the floors of each conference was the need for greater and more effective collaboration between all relevant stakeholders in the tourism sector. Moreover, understanding the pitfalls of embracing mass tourism without embracing sustainable practices. European Tourism Day is an initiative by the European Commission to incentivise the competition amongst major tourist destinations to adopt measures that improve the capabilities of destinations to manage greater tourist numbers, considering that MEPs mentioned that around 600 million arrivals (European Commission) were accounted for in the EU last year. At this year’s conference their focus was the need for European travel destinations to take on innovative strategies to enhance their abilities to capitalise on the economic potential of the tourism sector for growth in the EU without compromising EU values such as diversity, economic inclusion and - of course - sustainability. During the conference a special awards ceremony was held to congratulate Lyon and Helsinki for having won the 2018 EU Smart Tourism Award. The delegation of Helsinki hit home with a sustainability-themed message that “a good city for citizens is a good city for tourists” having adopted a strategy of balancing tourist accessibility with assuring continued good living of its residents; all in all, building a city attractive for everyone. Preach, Helsinki. The award ceremony was followed with a keynote address by Karmenu Vella, EU Commissioner for Environment Maritime Affairs and Fisheries, one of our biggest allies in the front for more sustainability at the legislative level. “Sustainability is a must” he said alluding to his time as Tourism Minister in Malta; an island nation where ignoring environmental concerns at the expense of greater tourism numbers would have dire consequences. He also referred to the importance of the sustainable plastics movement, particularly in relation to beaches, the use of Green Bonds and even Blue Bonds, and the EC’s further commitment to Integrated Coastal Zone Management scheme set up at the 1992 Earth Summit. Other MEPs present, such as Istvan Ujhely and Renaud Muselier, also mentioned the need for more young entrepreneurs to step up to sustainability challenges and how the EU hopes to aid this process. All of this is just the sort of talk Sea Going Green wants to hear coming from the EU! Day two in the Parliament building focused more on an area of key interest to Sea Going Green: the Mediterranean. 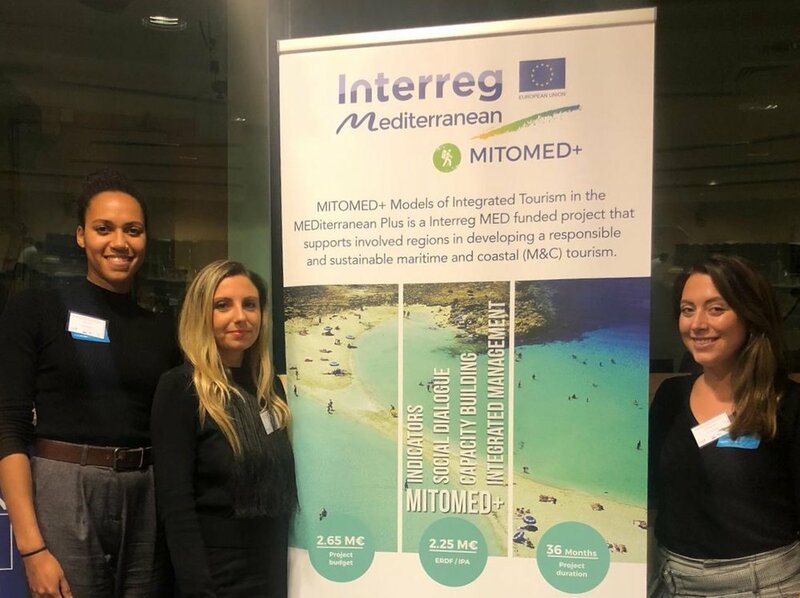 EU representatives at the conference were informed of crucial developments in managing sustainable tourism in Mediterranean destinations achieved through the MITOMED+ project. This project was initiated by Interreg Mediterranean - a programme based on cooperation amongst 13 Mediterranean EU member states for sustainable growth - with the purpose of collecting useful data related to tourism from numerous coastal tourist destinations, combining it in one single accessible comparative database. The ultimate aim here is to create an open platform available to national, local and regional governments, research institutions and private businesses in order to better adapt to an ever changing tourism market while ensuring growth remains sustainable and environmentally friendly. The project is still in development, and while most panelists agreed that the foundations of MITOMED+ have been well established by now there is still a need for more effective data and indicator collection. This is where Sea Going Green hopes to come in to help bridge the gap. As MEP Istvan Ujhelyi stated while opening the MITOMED+ conference, tourism is “the industry of peace and stability.” And with ten percent of total EU GDP riding on its continued success and growth in Europe, we can all agree that cooperation between all levels involved in keeping this sector thriving while sustainable is vital. Sea Going Green wholeheartedly embraced this theme and is excited to do its bit to further contribute to positive and sustainable growth in coastal tourism across the EU and beyond.